Until we have an efficient UK wide infrastructure to recycle our plastic waste within our borders then we need to find ways to reduce the volume of waste we generate. It’s important to note that most plastics claim to be recyclable. There’s just one snag; it’s not recyclable until it has been recycled. It is said that there is not enough capacity and insufficient infrastructure within the UK to process waste items. What capability we have to recycle is provided by private contractors who, naturally, will only process the waste if there is demand and the demand is profitable. If neither of the above can be met the plastic will be exported, usually to the Far East. Here’s where it gets interesting and ridiculous – a government backed initiative to ensure our plastic gets processed for recycling encourages this. The Packaging Recovery Note or ‘PRN’ is a form of currency in recycling and payment via the PRN is done by weight. If a contractor exports a mixed plastic bail weighting one tonne which, by default, will contain plastic that can’t be recycled in the UK, the contractor will receive payment for 100 per cent (note that the government will record this tonne of plastic as being 100 per cent recycled as it is not going into waste streams in the UK). If a contractor were to recycle the same one tonne of plastic in the UK and 50 per cent of it can’t be recycled, the contractor will only be paid for the 50 per cent they recycle. To me it’s absurd but government policy has inadvertently created a process that enables commercial enterprises to receive a greater subsidy by moving plastic abroad than processing in the UK. It is estimated that 78 million tonnes of plastic are produced each year worldwide! Nearly 800k tonnes of plastic scrap were exported from Britain last year. The items we are sending are so contaminated and mixed up that we are often just sending rubbish. We are using other countries with poor environmental and labour standards as a dumping ground. What happens when the shipment reaches its destination? We don’t know. However, as it’s well documented that China has by far been the biggest polluter of our oceans and most of the UK plastic waste was exported to China – go figure! China recently realised that it had earned the reputation as the world greatest polluter, so it introduced a ban on waste plastic imports. What do we do now? We find someone else to take it. Countries such as Bangladesh, Vietnam, Malaysia and Thailand are filling the void left by China. How robust are their respective environmental protection laws? It isn’t clear. What is clear is that the UK needs to take responsibility for its own plastic waste and not make it someone else’s problem. 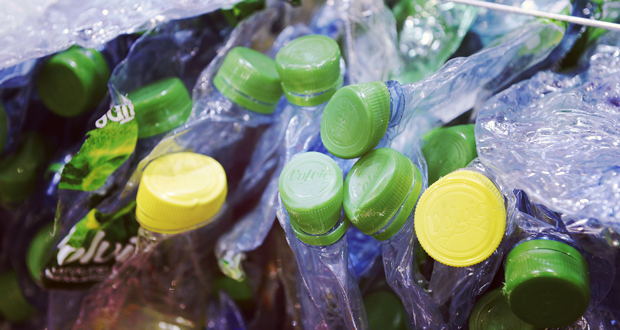 The most commonly used plastic in the production food packaging products is Polyethylene terephthalate (or more commonly known as PET) which is the material used to make plastic water bottles. It is easy to recycle PET numerous times but demand for recycled PET outstrips supply. Why? Because there isn’t enough recycling going on in UK. According to some statistics, the Americans produce 264 lbs of plastic waste per person per year, the UK 167 lbs and Sweden 40 lbs. So why is it so low in Sweden? Because they have a strategic government policy to enable an integrated recycling infrastructure to flourish. Currently in the UK, there is no government involvement or support in the recycling infrastructure. It is in the hands of the private business where profit will always be the driver. It has to be otherwise the business won’t survive. The value of recycled plastic is volatile. If we take PET (which is a bi-product of oil) as an example. In 2008, oil peaked at $144.30 per barrel and so the cost of virgin PET was expensive for manufacturers to buy. As a consequence, the value of recycled PET was high and recyclers could make good margin from selling RPET back to the manufacturers below the cost of virgin product. Five months later, it has dropped to $33.87 (which is when we enjoyed a significant reduction in petrol prices) and so the value of recycled product plummeted as it was cheaper for manufacturers to buy virgin product which is what they did. As a result, a number of businesses ceased trading and our capacity to recycle reduced further. At this point, with an integrated recycling infrastructure in place measures could be introduced to support businesses during tough market conditions. We need a subsidy if the price of recyclable material falls below a certain price and a payback to the government if it rises above a certain price. This way, the recycler is guaranteed a margin so it’s in their interest to maximise the volume of product processed. Another option is to put a tax on virgin product so recycled product is competitive by default. If there is the will to find a solution there is usually one out there. Oil is currently trading at circa $70 .00 per barrel so recycling is commercially viable – just. There is a high level of awareness now amongst the population in general regarding the use of plastic packaging. As with all of these things, there has been some knee jerk reaction to ban plastic in the work environment but that is not realistic as there isn’t a workable commercial non- plastic solution for all our needs. Ensure you have visibility of your waste contractors recycling capability and that they can maximise the amount of your plastic waste they recycle. Ensure the act of separating the waste by your teams is signposted with easy to understand signage. Educate your teams about the importance of recycling by holding “Environment Days” lunchtime sessions with guest speakers who can deliver a clear message. Encourage debate amongst your teams about initiatives they can come up with to reduce the use of plastics – be collaborative! Encourage your teams to reduce the amount of plastic they use by offering reusable alternatives. Have water stations around the building so reducing the need for teams to buy plastic water bottles. Don’t provide single use water cups at the water stations but encourage the purchase of reusable water bottles by selling below high street prices. In conclusion, we don’t need government threatening to ban plastic straws / plastic cotton buds or putting a tax on disposable cups (latte levy) and then failing to do anything. We also don’t need politicians to be seen walking into Downing street clutching a reusable coffee cup to demonstrate they are doing their bit to save the planet. It’s just not helpful. We do need a strategic government policy to enable an integrated recycling infrastructure throughout the UK that will drastically reduce (ideally eliminate) our contribution to the worlds waste plastic problem.